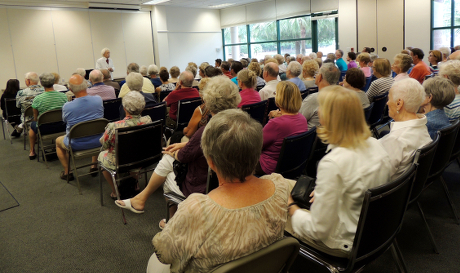 The witty persona of Mark Twain was brought to life on April 11 before a full house at the MCA Community Center. Actor Alan Kitty arrived in character and stayed in character, clad in the white suit that was Mark Twain’s hallmark fashion statement. Kitty captured the fiery spirit of Mark Twain and his humorous outlook on everything that touches the human heart, mind, and funny bone. Kitty, as Twain, shared incisive life perspectives with a captivated audience. Chuckling rippled through the audience each time a story’s humorous twist took them by surprise. With the impeccable timing of a stand-up comic, Mark Twain’s tales sometimes poked a little fun at human foibles, particularly in reaction to life’s challenges.